Home »Photography»Canon 7D Tips – Burned by ebay? Try this for Used Cameras & Lenses! You can find bargains on ebay, but Buyer Beware when shopping for cameras, lenses and accessories. I admit it. I do use ebay for somethings. But, it only takes getting burned once for you to be more cautious. I was looking for some additional compact flash cards and found a seller with 16gb Sandisk Extreme IVs for a crazy low price. I bought a few. But, I was suspicious when the box was opened and these “new” cards did not include a plastic clamshell case. I actually called Sandisk and gave the rep the serial numbers. They were counterfeits! Thankfully, I was able to get my money back. But, with used equipment, you are really taking the seller’s word that the equipment was not mishandled. If you put a camera or a lens in a good neoprene case and drop it, there is little chance that the outside would show any damage. However, the impact could easily affect the functioning of the equipment … maybe that’s why the seller is really selling it?? Considering the cost of camera equipment and lenses, why take a chance?? You need to buy used equipment from a reputable seller like Adorama and B&H Photo. Both Adorama and B&H Photo have very active Used Equipment Depts. They buy and sell used equipment on a daily basis. What sets them apart from ebay vendors is their rating systems. When a camera, lens or other accessory comes in, it is thoroughly tested and rated according to their scales (see the charts above). They also stand behind their ratings. Since their used stock is constantly changing, it is a good idea to check both companies on a regular basis. You never know what you might find. Best yet, used equipment is approximately 20-30% off the cost of it new! When you are talking about a pro Canon L lens costing thousands, that’s a nice savings. I have purchased used lenses from both Adorama and B&H Photo. 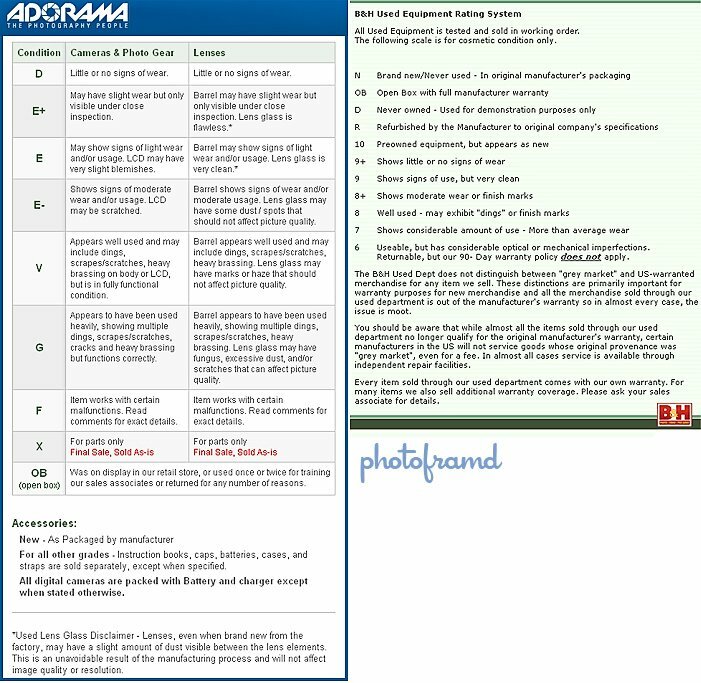 My Canon 35mm f/1.4 L and Canon 24mm TS-E L were rated an E from Adorama. My Canon 85 f/1.2 L was rated a 9+ from B&H. Excellent lenses at a real discount. Used lenses are a great way to build your collection! Just remember to pick-up a Mack Warranty at the same time. I love the service from Adorama…really quick. Haven’t tried B&H before. Gonna have to check it out. Thanks. It pays to shop both for used equipment to find the best deal on rating and price. I am very impressed with your Zenfolio site! Great collection of photos!